Towards the end of last year, Twitter confirmed that it was working on a new ‘Bookmarks’ feature to make it easier for users to save tweets for reading later. But, it now seems that the feature is ready for use and has started rolling out to Android users. Note: I tried this feature on the Twitter app (v 7.31.0-alpha.641) installed on my Redmi Note 3. 1. Once the Bookmarks feature has been rolled out, you’ll see that the DM button under the tweets have been replaced with a typical share button. 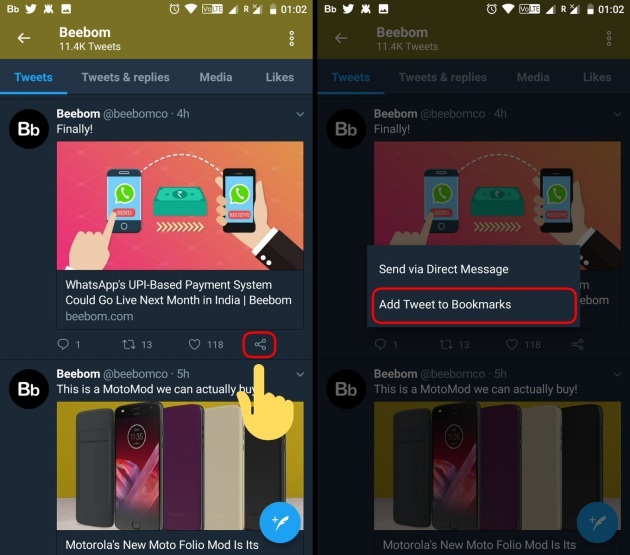 Tapping the said button will show a pop-up holding the ‘Add Tweet to Bookmarks’ option, which can then be selected to save any tweet for reading later. 2. 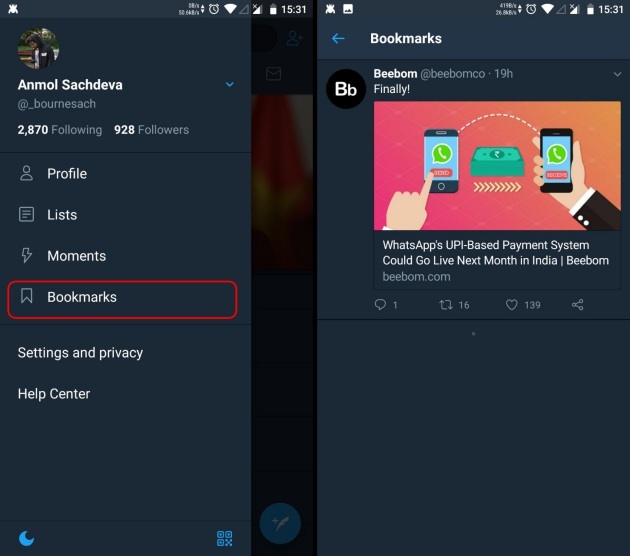 Now if you want to check out all bookmarked tweets, you need to open the navigation drawer menu on the left and select the newly added ‘Bookmarks’ option under the Moments one. You’ll then see a list all tweets you’ve saved for later and can access any of those right here. Note: You can simply tap on the share button once again to remove the tweets from the Bookmarks list. In the days without bookmarks, Twitter users have resorted to a variety of methods to be able to save tweets. Be it liking or retweeting, which meant publicly sharing the likes, or the more common alternative of sending the tweets as DM to yourself, are both clunky for a simple bookmark functionality. Bookmarking is also expected to find its way to all Twitter clients, as well as the web interface, once the company starts rolling out the feature widely to all users. So, are you looking forward to trying out the Bookmarks feature? Tell us in the comments below.